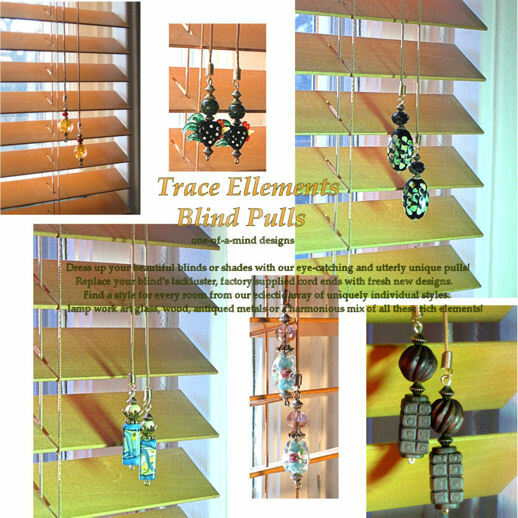 Trace Ellements Blind Pulls are one-of-a-mind designs specifically created to dress up your blinds or shades with our eye-catching ornamentations! Replace your blind's lackluster, factory-supplied cord ends with fresh new styles. Find a design perfect for every room from our eclectic array of uniquely individual styles created from lamp work art glass, wood, antiqued metals or a harmonious mix of all these rich elements! Please see specific styles for details on each design.